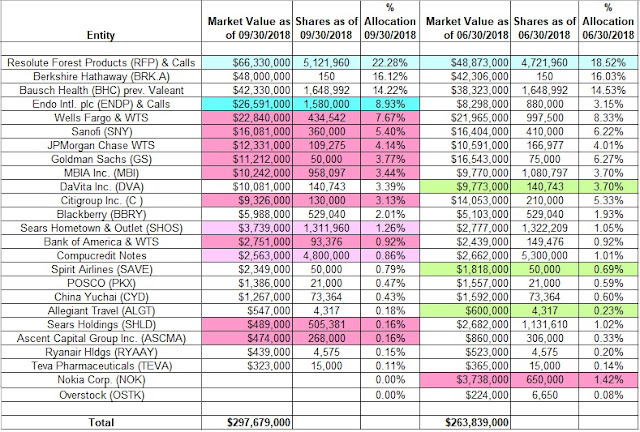 · Chou’s 13F portfolio value increased from $264M to $298M during the quarter. · Chou increased Endo International while reducing Goldman Sachs. · Resolute Forest Products at ~22% of the portfolio is the largest position. 1. Resolute Forest Products (RFP): The ~22% RFP position has been in the portfolio since 2010 (Abitibibowater at the time) and the cost-basis is much higher compared to the current price. Q2 2013 saw a one-third increase at prices between $13 and $16. The five quarters through Q1 2016 also saw a ~20% combined increase at progressively lower prices between $4 and $19. The stock is now at $12.33. There was a ~7% trimming in Q4 2017 while last quarter saw a marginal increase. That was followed with a ~9% stake increase this quarter. 2. Berkshire Hathaway (BRK.A): The ~16% portfolio position is the second-largest 13F equity stake. The last major activity was a 50% reduction in Q1 2016 at prices between $187,000 and $214,000. The stock is now at $328,300. 3. Bausch Health (BHC) previously Valeant: BHC was the largest position at ~15% of the portfolio as of Q3 2017. The stake was almost eliminated in Q4 2017 at prices between $11 and $22. The original position was from Q1 2016 at prices between $26 and $102 and increased by ~48% the following quarter at prices between $19 and $36. There was another ~35% increase in Q4 2016 at prices between $13.50 and $24.50 and that was followed with a ~20% increase the following quarter at prices between $10.50 and $17. Q2 2017 saw another ~30% increase at prices between $8.50 and $17.30. There was a ~10x stake increase in Q1 2018 at prices between $15 and $24. The stock currently trades at $27.10. Chou realized losses and rebuilt the stake at lower prices.